My mind is playing tricks on me, and I have the proof. I have to battle with suspiciously empty spaces in my mind where a nugget of information was supposed to reside and I um and ah my way through many a conversation these days. My concentration is absolutely shot and the other day I found myself wondering why a coffeeshop's sliding doors wouldn't open for me when it turns out they weren't sliding doors at all. It took TheHusband to nudge them open for me before I clicked. Oh the embarassment! I normally pride myself on my quickness to grasp new information, but alas, that seems to have fallen by the wayside too these past few weeks. 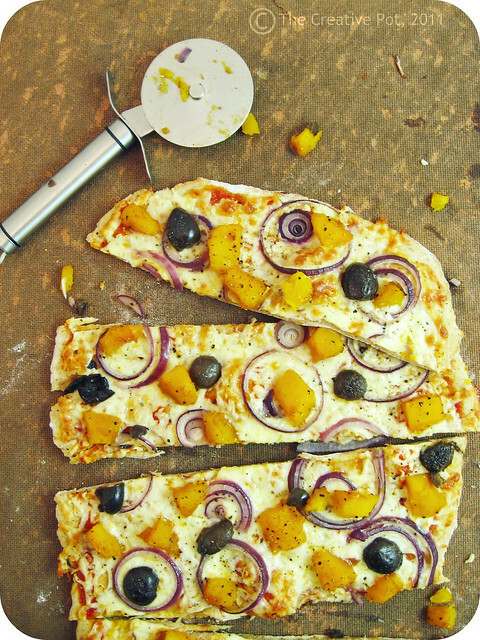 So it was with this butternut and olive pizza. In my mind, I could've sworn I'd seen a similar recipe for a tart, Italian in origin and the combination of the salty morsel with the sweet creamy pumpkin wannabe sounded sublime. Not to mention the lively colour contrast such a pairing would surely deliver. But when I googled it this morning to try and find an authentic backstory for my almost-authentic Italian topping, I came up with nothing. Riiiiggggght. The combination has been done before, sure, but as for the authentically Italian bit... mmm not so much. But authentic or not, it turned out damn tasty. Even though TheHusband preferred the alternative topping* I offered. But then, we all know by now that his tastes are not to be trusted. *For those TheHusband supporters/curious cats out there, the second topping option was biltong, babymarrow and peppadew. Not bad. Not bad at all really. 1. Place butternut in a medium saucepan with a little bit of water and cook, covered over medium heat until soft. This should take about ten minutes. Season to taste and stir balsamic reduction through. 2. Meanwhile, preheat oven to 220C and roll out your pizza dough on a floured surface. Spread with tomato paste and scatter mozzarella over. 3. 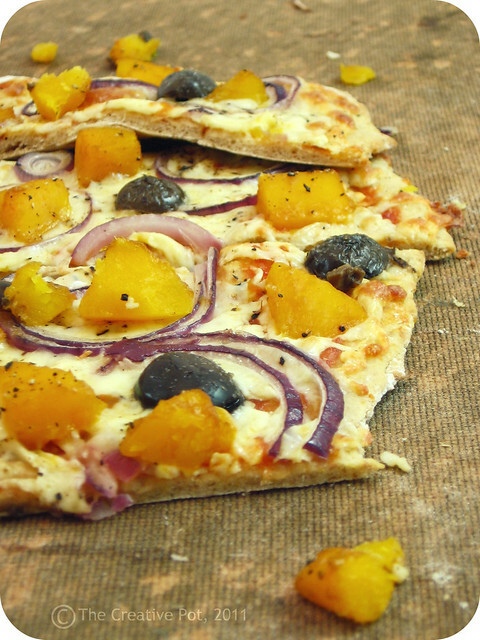 Arrange red onion slices, butternut cubes and olive halves on the pizza base, finishing off with sprinkle of salt and a black pepper. 4. Transfer to a baking tray/pizza stone/piece of heavy duty foil (my personal favourite!) and bake for approximately 12 minutes or until the cheese is melted and the base cooked through. Remove from the oven, slice and serve. Variation 1: Add feta for a delicious twist on the above. Variation 2: Boost the health benefits already present by substituting about 1/4 of the flour with wholemeal or rye flour. As an added benefit it makes the pizza more filling too. Very nicely made pizza, Marisa. I love the colours. CONGRATULATIONS! I had a sneaking suspicion that this was why you've been missing so much lately! (Plus every other blogger is pregnant, so why not?) So happy for you! I love this topping. if the husband doesn't want his share, I'll totally eat it. Looks gorgeous! The colour combination makes it look so inviting. Re sliding doors, don't worry - been there done that, on numerous occasions. hang in there with the memory loss, it's for a good cause ;) This looks delicious with butternut on there. You're not alone. I once stepped aside for the person coming towards me in a shop....it was a mirror. Lol, the minute I read your post, I thought "pregnancy brain!" but I wasn't going to write that until you revealed it- which you did a few lines down so CONGRATULATIONS!!! This is going to be one well-fed and foodie-savvy baby. Congratulations! But should I warn you that 13 years after giving birth to my youngest, I still have pregnancy brain?